If you were to drive an hour north of Philadelphia – the birthplace of the U.S. Constitution – you would come across another historic American region. Lehigh County is located within the larger Lehigh Valley – a place that boasts of Pennsylvania’s most opulent natural landscapes and traditional architecture, along with many Revolutionary War era burial grounds. But for all its beauty and rich history, Lehigh County has a target on its back. 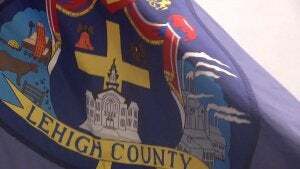 After radical atheist groups filed a lawsuit, a federal district court reluctantly declared the seal and flag of Lehigh County unconstitutional because they contain an image of a cross amidst images of a heart, bison, cement silos and a courthouse. Throughout the country, extremist groups have put religious symbols in the “crosshairs.” They claim that religious symbols that are in virtually any way connected with the government—whether symbols, seals or land such as memorials—violates the Constitution by establishing an official religion. They want to fundamentally change America. They want to transform heart and soul – the DNA – of our tradition, history, and heritage. Anti-religious groups, for example, are so zealous to cleanse religion out of the public square that they won’t even tolerate the public recognition of religious imagery that is simply part of a community’s historic tradition. Their contentions, however, are fallacious. And the fallacy has shown itself in the Lehigh County case. This wave of attacks is not limited only to seals and flags, however. Atheists, for example, have repeatedly attacked veterans memorials because they contain religious symbols. And these assaults have deeper and more pernicious implications. Recently, First Liberty has been involved in defending the cross-shaped Bladensburg WWI Veterans Memorial which is under impending threat of being demolished following a lawsuit from a humanist group. Courts, however, have held that cross-shaped memorials are universal and traditional symbols of sacrifice, with the cross shape transcending any religious significance. Yet a humanist lawsuit and judges who accepted their radical reasoning have now put the memorial and others in jeopardy. Not even this iconic war memorial is safe – although families have long considered it a historic gravestone remembering the sacrifice of 49 servicemen during the Great War. Fringe groups commonly target religious imagery that is simply placed in, for example, a government seal because it is grounded in history and tradition. But, it is the historic and traditional significance of the symbols that exposes the errors in the radicals’ argument. There is no “establishment” of religion. There is simply a recognition of the historic significance to a community of symbols that are religious in origin. Across the United States, seals, flags, and names of localities contain references to divinity and religion. 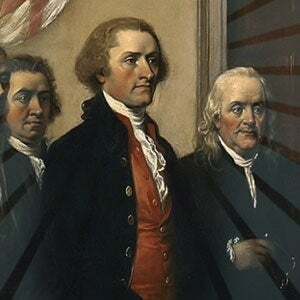 Many have existed for centuries, and indeed, some even predate the Constitution. A reasonable observer would consider such images to be part of a longstanding tradition of recognizing the history and culture of founding communities. In the landmark case Town of Greece v. Galloway, the Supreme Court cited that public references to religion comply with the First Amendment because they are a part of our country’s history and heritage. These include the national motto, “In God We Trust” and the phrase “one nation under God” in the Pledge of Allegiance, for example. Despite the legal precedent, radical groups insist on undermining the constitutional rights of Lehigh County and hundreds of other governing bodies. A number of states throughout the country have overt references to divinity or religious symbols. The seals or flags of Utah, New Mexico, Oklahoma, Florida, South Dakota, Colorado, Maryland, Massachusetts all have some type of religious imagery. Similarly, counties across America follow in the footsteps of their state counterparts, as their respective flags or seals exhibit religious symbols. The question then becomes: Why can’t Lehigh County have them as well? It is simple, really. Atheists and extremists want to exterminate religion from public life altogether – even if it means disrespecting and dishonoring the historical traditions. It is even more dangerous and alarming when a court erroneously holds that any mention of faith in a community is unconstitutional. It could lead down the road of endless litigation where any expression of faith could be misconstrued as an establishment of religion. 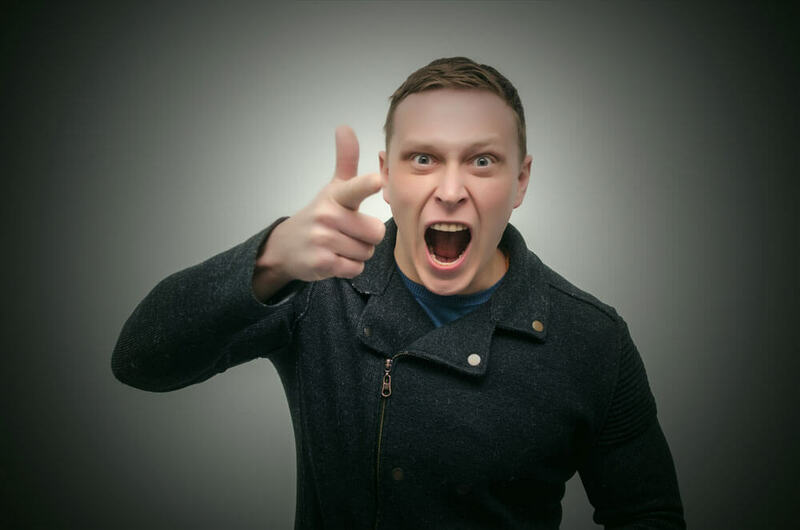 That grim possibility is why First Liberty is at the forefront of this battle. We are leading the charge to counter the opposition’s attacks so that individuals and communities are able to commemorate their history according to their cherished traditions—even if those traditions include images of religious origin. Show your support for our national motto. 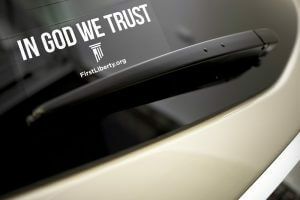 Order your “In God We Trust” window cling!